December is always a hard month for me. My sleep schedule is strongly affected by sunlight which is no fun during the dark Pacific Northwest winters. Being tired makes everything else harder. Now that we’ve passed the autumnal equinox and the days are once again getting longer, I feel hope and energy building once again. What am I doing with that energy and hope? I’m wrapping up a major open source governance and sustainability research and writing project. This is a client project I’ve been working on since the Spring and I’m very excited to have it nearing completion. I think it’s good, necessary work and I will be finding a way to share it widely in the months to come. I’m also finalizing the details of my next major professional project. I’m super excited about it. I think it’s a great fit, both for me and for the organization I’ll be working with. I’m looking forward to starting that sometime next month. Full details coming soon! My priority during the last quarter of 2016 has largely been one of self-care. Putting my oxygen mask on before helping anyone else put on theirs. I spent a good deal of it sick and then recovering from a sinus infection. I slept a lot, as I always do during this time of year. I went heads down to concentrate and wrap up client projects. I completed my second and final (for now) 3-year term on the Stumptown Syndicate board of directors and have handed off my duties to the new board. I secured my next big professional project, and thus an income for our family for the next while. Now I’m planning what to focus on during the year ahead and how to make progress towards the efforts I mentioned the day after the election in my post Radicalized. The most important of these efforts, the one which I think encapsulates all the rest is to help build self-reliant, self-sustaining communities. One of the main ways I feel I can contribute to this is to continue building, practicing, and sharing basic life skills: gardening, carpentry, plumbing, and electrical. 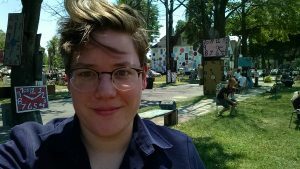 If someone in my community is having trouble getting services for their home, either because they are refused or because they can’t afford it, I want to be able to help. If you are in need of help in one of these areas, let me know and we’ll work together to figure it out. If you’re particularly skilled in one of these trades and are local and want to teach me some of what you know, please also get in touch. Regarding direct community organizing, I’m figuring out what my role should be. 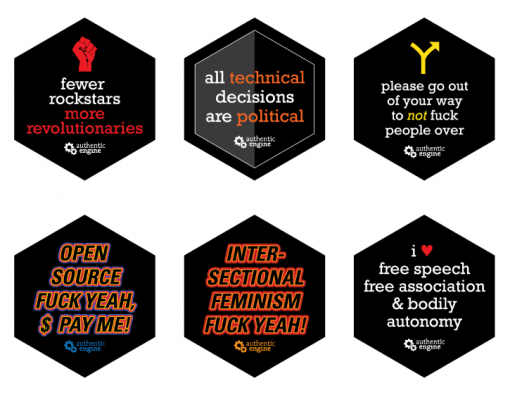 I continue to feel worn out from the last several years of organizing Open Source Bridge and other Stumptown Syndicate related activities. And from organizing within the Mozilla community. I continue to struggle to reconcile how vile the tech industry is with how rooted I am in it. It’s not such an easy thing to simply leave the industry which has defined your entire career and adult life. I’m working through this in a couple of ways. First, I’m being very deliberate about the tech work that I do engage in and what I expect the result to be. I am no longer looking for a job or an employer to complete me or to serve as a second home for an indefinite period of time. I work on things where my expertise is needed, where I can make a worthwhile contribution in a constrained period of time. Second, I’m making deliberate efforts to build community unrelated to tech. After some searching, we’ve found a spiritual community (an Episcopalian one) that seems to be a good fit and I’m looking forward to sticking around and seeing where that leads. I have a lot of reservations and conflicting feelings about Christianity, none of which I’ll go into now, but I’ll say this: something in me is rejuvenated each week when we partake in worship. And I need that kind of regular uplift right now. Third, I’m reading and thinking a lot. I’m reading about labor organizing, systemic racism, social change, etc. I’m using that knowledge to locate myself and ourselves in history. To contextualize where we are at, how we got here, the different ways can respond, and where that might lead us. In addition to wisdom, I’m also looking for glimpses of hope and beauty here and there. I don’t know if I will ultimately do more organizing within tech, or if I will focus on contributing to community outside of tech, or both. Meanwhile, I’ll continue to share what I’m learning, here on the blog, on the Recompiler podcast, and in one-on-one conversations. I’ll continue to produce the Recompiler podcast. My main goals for this year are to continue improving it with consistent weekly publishing, timely content, as well as audio and narrative quality, and to grow its audience. Write and publish a second edition of the Community Event Planning book. We’ve learned a lot since we wrote the first edition. I’d like to include that material as well as more case studies and first-person accounts from many different event organizers. Revise and publish the open source governance research I’ve been working on for a client. Open source projects and their foundations have gained significant prominence over the last 10-20 years, but most people have no idea how they work. Whether you’re an individual contributor, or you’re directly involved in the running of a project, I think this is important knowledge to have. Finally, I’ve included the following on my project board, in the “art & beauty” category: take photographs, make a quilt, grow flowers. What about you? What are you working on in 2017? A year ago tomorrow was my last day as a Mozilla employee. Quitting was the one of the best decisions I’ve ever made. I’m working for myself and I love it. Building a wood bookcase from scratch. Bookcase I built from scratch. Watching and photographing the birds that visit our yard. 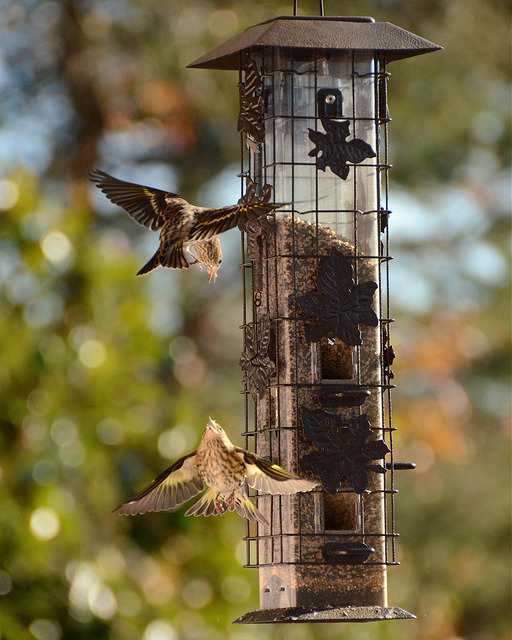 Pine Siskins have words at the feeder. Recruiting and on-boarding several new Stumptown Syndicate board members. Driving to California (accidentally during a snowstorm) to visit family. 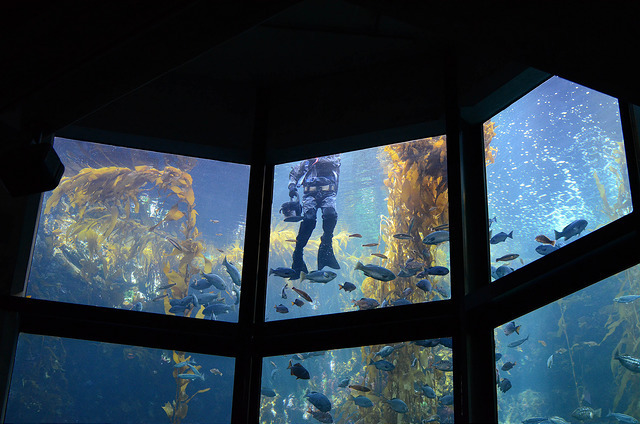 One of the things we did on the trip was visit the Monterey Bay Aquarium, which I had never been to. Starting a consulting practice, Authentic Engine. I have a few client projects now, and am looking to book more work for the Fall. Know an open source project wanting expert help with participation, leadership, or governance issues? Get in touch. I’m also available for contract programming (python, php). If you like stickers, I have those for sale too. No endeavor is truly launched until it has stickers. And so it is with Authentic Engine. Buy some! 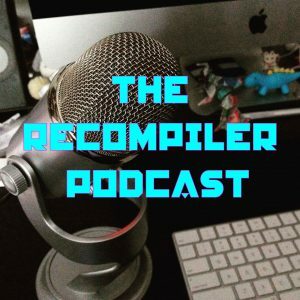 Learning audio recording and engineering and launching the Recompiler Podcast. Handing off the organizing of Open Source Bridge to two new co-chairs! 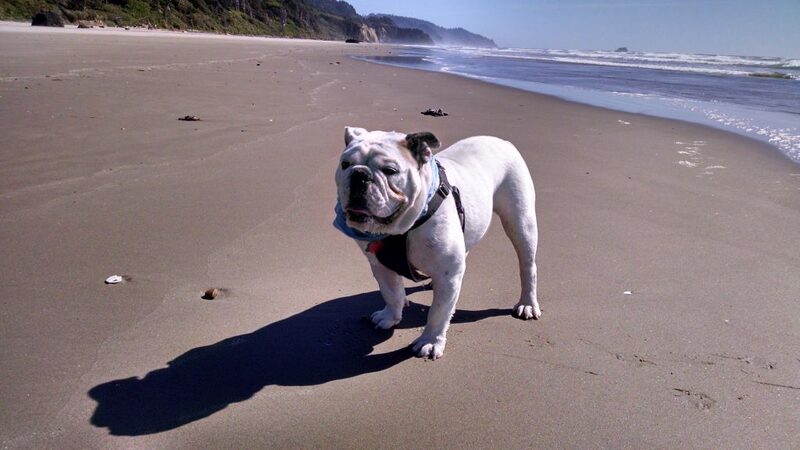 Taking Bertie to the beach for the first time. He loved it. 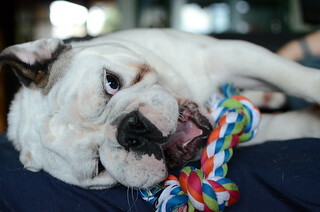 Although, we learned the hard way bulldogs really can’t exercise for very long because Bertie needed several days of recovery afterward. Bertie’s first trip to the beach. Seeing my favorite band, The Cure. Twice! Once in Los Angeles and again closer to home in Ridgefield, Washington. 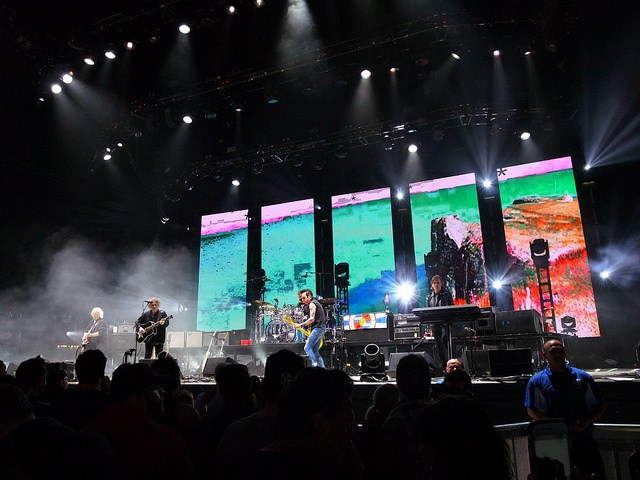 We had much better seats at the Ridgefield show and had a fantastic time. Touring SpaceX. 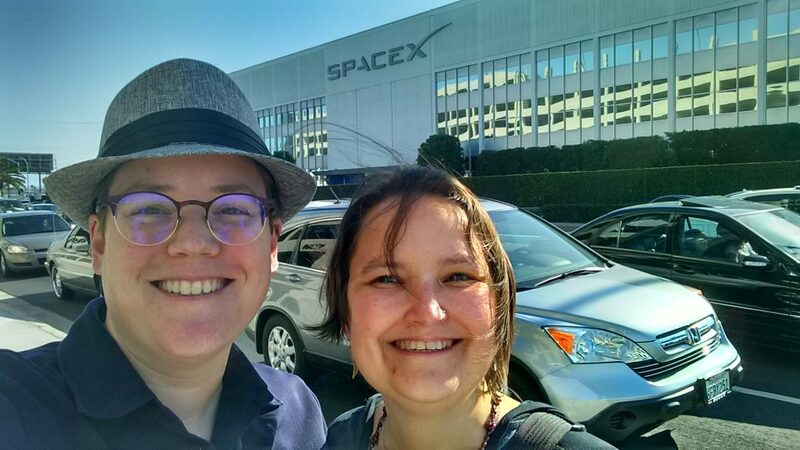 While we were in LA to see The Cure, a friend of ours arranged a tour of SpaceX. It was amazing. Couldn’t take any pictures inside, unsurprisingly, but managed to get a goofy selfie outside. Smiling because we just toured a fraking rocket facility! Attending Allied Media Conference, including the excellent Growing our Souls tour (my photos) of Detroit. Shopping for individual health insurance plans three times. Yes, three times in one year. The first was before I left Mozilla because applying COBRA would have been prohibitively expensive (~$1,400 per month). The second was during 2016 open enrollment because our rates had been raised over $100/month. The third was last month when the State of Oregon abruptly put Oregon Health Co-op into receivership. Fun times! But, hey, at least thanks to the ACA, we can actually sorta find health insurance outside of a group plan. We’re with Providence now and we hope they stay affordable and in business for a while. Gardening. Lots and lots of gardening. 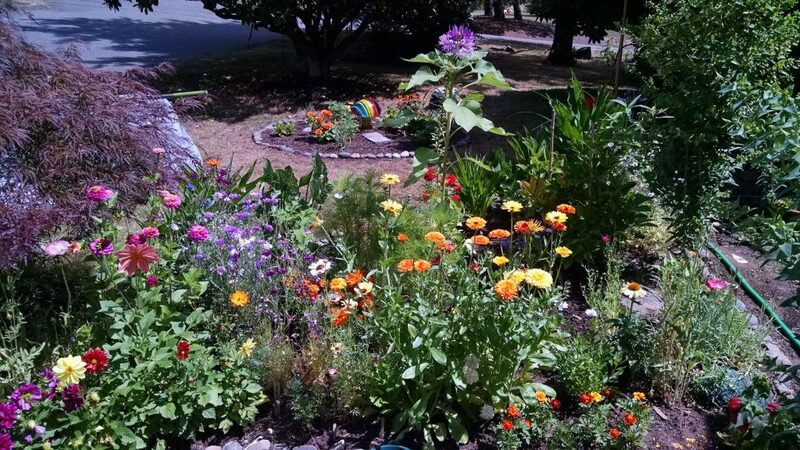 This year we planted lots of vegetables and added several new flower beds, populated mostly with plants I started from seed. It turns out I have a bit of a green thumb! Who knew? 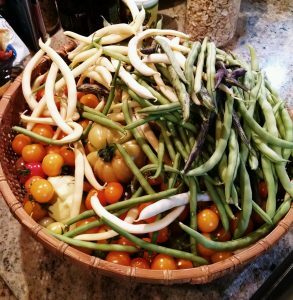 An evening’s harvest from our garden. Flower beds in bloom. Most of these I grew from seed. Photographing the flowers I’ve been growing. I don’t have a macro lens, but am faking it well, I think, with my 35mm and some close-up lenses. 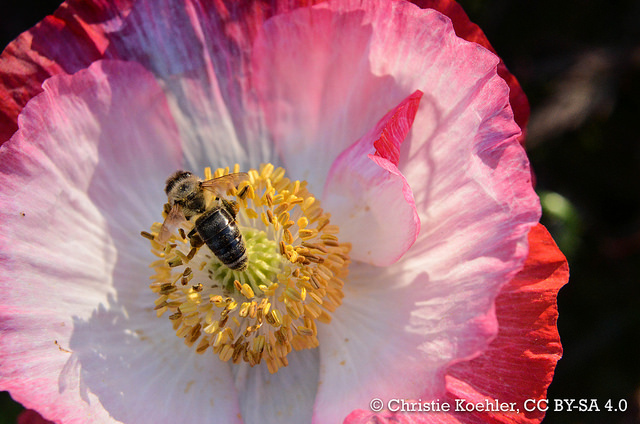 Bee on Shirley Poppy, one of the many flower macros I’ve taken this season. Watching hot air balloons launch at the Tigard Festival of Balloons. I first heard about this festival shortly after I moved to Portland in 2007 and realized just before my birthday that it’s practically in our neighborhood, so Sherri got us tickets. It was challenging to get up at 5am to get ourselves over there in time for the sunrise launches, but it was so worth it. 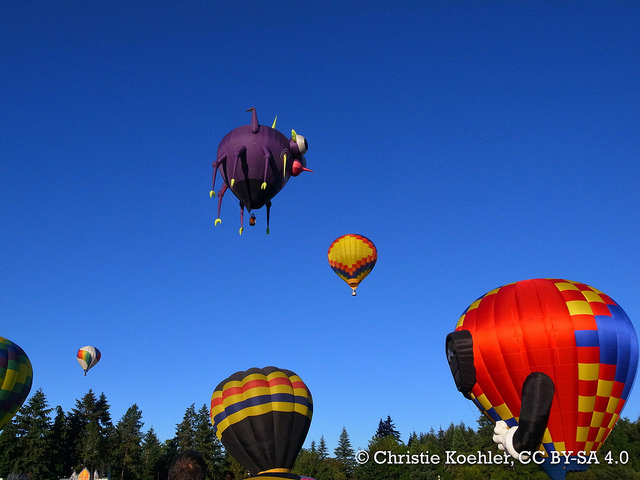 Hot air balloons launching at the Tigard Festival of Balloons! Speaking at Open Source & Feelings on a really tough topic. Reading and more reading. Soon I will have read all of Walter Mosley’s Easy Rawlins‘ books and this will be bittersweet. I take solace in knowing I still have plenty left to read of Mosley’s Fearless Jones and Leonid McGill series and I’m only a little over half-way through Laurie King’s Mary Russell and Sherlock Holmes books. Plus you never know when you’re going to stumble across a great new detective series such as M.J. McGrath’s Edie Kiglatuk or Cara Black’s Aimee Leduc Investigations. Feeling better about myself and being less stressed than anytime during the previous 4+ years. Our income isn’t steady yet and dealing with health insurance is obnoxious. But we’re making it work. I can say now that leaving a job that was steadily grinding me down was absolutely the right call, even if it felt totally wrong at the time. Thanks everyone who’s supported me along the way and continues to do so! You make all the difference. If there’s anything I can do for you, please let me know. Since I last posted on the subject, I’ve made quite a bit of progress towards starting the next phase of my career. I’m excited to share that with you all now. One of the things I’ve learned through my 4 years at Mozilla and 8+ organizing in the tech community is that most everyone wants to contribute towards making stronger, healthier, more inclusive and resilient communities. The problem is that they don’t know how and the opportunities to learn and practice the requisite skills are few and far between. So that’s what I’m going to concentrate on: Providing the leadership learning we need and hunger for. As such, I’ve founded a consultancy, Authentic Engine, which will focus on providing empathy-based leadership learning and practice opportunities. There’s a huge emphasis now in our community on improving Diversity & Inclusion, as well as safety and incident response (including Code of Conduct adoption and enforcement). These are important skills our community organizers need help developing and honing. Talented folks are leading efforts here and I look forward to working with them. I have chosen something slightly different, although complementary. I want to help develop leaders, stewards, and organizers who cultivate wisdom over time and who will be equipped to adapt to the changing needs, stresses, and resources of their communities. I want to teach people how to lead and steward authentically, utilizing their unique combination of experiences, talents, and interests. With Authentic Engine, I’ll help people develop into the leaders and stewards our communities need now and into the future. Launch 4 (roughly one per quarter) 3-4 hour workshops, each on a specific leadership/stewardship topic. The first will be a guided exploration of what leadership is, what kind of leader you want to be and how to become that leader. The workshops will likely debut in Portland and I’ll bring them to other cities as there is demand. The workshops will not be free, but they will be affordable and have scholarship slots. Facilitate an on-going community cohort so that folks engaged in improving themselves as leaders and stewards have a support and peer-learning network. Provide at least 100 hours of one-on-one coaching and mentoring. Anyone who takes one of my workshops will get some amount of free coaching. managing and responding to crises, including: embezzlement, intimate partner violence, food-borne illness, unexpected budget shortfalls, and more. This is a huge venture to undertake and I’m excited about it. I hope you’ll be part of making my journey successful. Sign-up for the Authentic Engine mailing list so you’ll be notified when I launch new workshops. Register to attend a workshop (once they are launched). Let me know which leadership/stewardship topics you’re most interested by completing this interest form. If we’ve worked together and you found the experience worthwhile, write and send me a testimonial I can post to my website (and/or recommend me via LinkedIn). Recommend me to folks who could benefit from my leadership development consulting services (see above for the list of things I have experience doing). Most of all, continue to send me your encouraging words. These mean so much to me and really help carry me through the days that feel completely overwhelming. That is inclusive to the point of radicalness, where people gather in solidarity at the edges. Where everyone is able to contribute fully and authentically, whatever that means for them. Where everyone has a part in making the community more prosperous and resilient. Where we plan collaboratively, thoughtfully balancing short- and long-term goals. Where compassion and empathy are as present and valued as technical skill. Where a code of conduct is an expression of shared values and but one of many tools we have and are able to use effectively to increase belonging among us. Where expulsion is rare. Where those who transgress and those who are transgressed upon are supported alike. Where we work collectively to resolve conflict and division between us. Where we are able to stand with the poor, the marginalized, the disenfranchised and strive to understand the world from their point of view. Where we create tech products together, that serve all of us better. Where we are able to shift technology as a mechanism for concentrating power to one that distributes it and empowers all the world’s people. Where we recognize that technological decisions cannot be divorced from their emotional, sociological and political contexts and we strive to take these factors into account. Where we develop the wisdom to recognize when issues are primarily social/political not technological and we work to address them in their appropriate spheres. Where we have the courage to speak up when we see destructive behavior because we know others will have our backs and we will not stand alone and become targets ourselves. Where we love the difficult people as well as the easy ones and we give each the time and support they need. Where we can gather and find fellowship in good times and bad times alike. Where we recognize, honor and respect the great diversity in our backgrounds, life histories and worldviews. Where we strive to minimize the discord that might come from our differences and maximize the harmony of our share experiences. …That’s the tech community I want to be a part of. 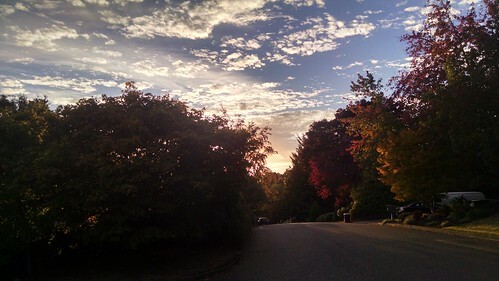 Portland in Fall. It’s my favorite season here. It’s been 2 months since my last day at Mozilla. Hard to believe that much time has past and yet it feels like it’s gone by so quickly. Rainy, gloomy weather has arrived here in Portland, for which I’m very grateful after such a long, hot summer. My plan for my first weeks away from Mozilla, most of September, was to spend as little time on the computer as possible and to intentionally not think about my next career steps. I give myself a B at following this plan. At first I did great. I did a lot of work around our house, mostly in the form of tidying and organizing. 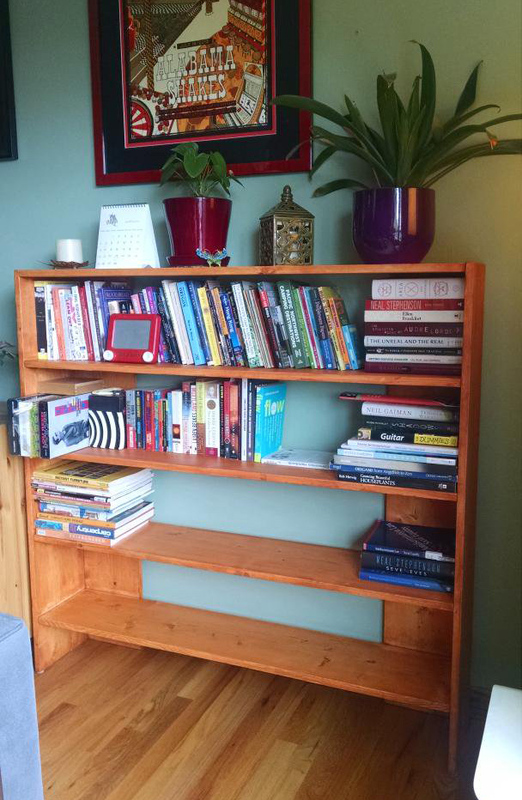 I made a bookshelf from scratch and am very happy with how it turned out. I played a lot of Civilization. I read. I slept in. 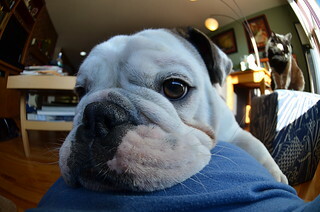 I played with the dogs and took photos. Bertie is always around to remind me of the value of play. And then I started reading & responding to my email. As good as it was to hear from everyone, it also meant that I started thinking about “what next” much sooner and in greater detail than I was ready for. I started having some conversations about projects that were exciting, but also left me agitated and unsettled. Earlier this month I had a follow-up with my doctor that left me feeling down and depleted. It wasn’t a bad visit and was actually rather uneventful except that I left with an even longer list of asthma-related tasks to do. Pull up the carpet in our daylight basement (where my office is), have the air ducts cleaned, make the bedroom as sparse as possible, do this breathing training program, etc. And my blood pressure is a tad on the high side (in the right arm, but not the left?). As my lack of accomplishment and I left the doctor’s I decided to stop by Powell’s as a way to cheer myself up. (I almost always want to browse books and it nearly always cheers me up.) I did a quick scan of the ‘careers’ section — which is a bit of gamble because there is so much there that’s either irrelevant (“You’ve just graduated, now what?”) or cheesy (literally, “Who Moved my Cheese?”) or just not applicable (there’s no “The Tech Industry Burned Me Out but Then I Found This Awesome, Life-Fullfilling Vocation and Here’s How You Can Too!”). I did notice a copy of The Joy of Not Working. Huh, I thought, that sounds nice and bought it after scanning through the first couple of pages. I continued reading at home and finished that day. I definitely don’t want to work for someone else. Working for myself will give me the greatest freedom and agility. I need to focus on fewer work-related things so that I can do them really well. I need to give myself the time and the space (even if it’s scary) so that I can identity the work I truly want to be doing and how to make that possible. I want to get to the point where my average work day is 4 hours so that I have plenty of do other activities that nourish my mind, body and soul. I want to utilize and expand my experience facilitating teams, communities and organizations. I want to apply and hone my aptitude for systems thinking, for motivating people to do awesome things, and for improving processes. I want to apply my knowledge and love of business (nonprofit and for-profit) as well as tech. I want to help businesses and organizations do better work with happier, healthier and more productive teams. I have a name picked out. I have a marketing plan and continue to improve it as I learn more and more about marketing. I have a launch plan. I’m figuring out how to make the finances work while I drum up business. It might involve some crowdfunding. I’ll be reaching out to a lot of you for support, in whatever capacity you can provide it (hugs, referrals, a loan/gift/investment of equipment or cash, etc.). If you know someone doing this kind of work and think they would be willing to chat with me about their experience, please introduce us. If we’ve worked together, or you know of my work so far, I hope you’re excited. I am certainly am. I’m excited about bringing the same kind of energy, vision and integrity to this new practice as I have to other projects. I’m excited at the opportunity to partner with all kinds of organizations do their work better, more prosperously. If you want to know for sure when I launch, subscribe to my TinyLetter. Meanwhile, I’ll be sure to keep making time for rest and for taking awesome photos of Bertie, Dora and the rest of the critter cadre.